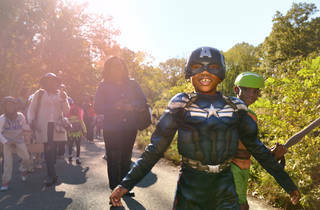 Prepare for ghoulish happenings all over Prospect Park! Boo at the Zoo, which takes place every weekend in October (10am–5:30pm), will feature a costumed scavenger hunt plus Halloween-themed games and projects, all of which provide frighteningly good fun. Gather the goblins for a truly hair-raising Halloween Haunted Walk and Fair (Oct 27 from noon–3pm)—just beware of the spooky creatures you encounter! End your afternoon at the family-friendly after party BKLYN BOO! at City Point (make sure to RSVP online, and note this is ideal for families with children ages 7–12). While you're making a trip to the park, make sure you take a spooky spin on the Haunted Carousel (Oct 27 from noon–5:30pm, $2.50 per ride) and then enjoy Scary Stories with Tammy Hall (2–4pm)...if you dare. For those tots who aren't inclined to be spooked, opt for the Halloween Cut-Outs, crafts based on a Lefferts family design (1–4pm). 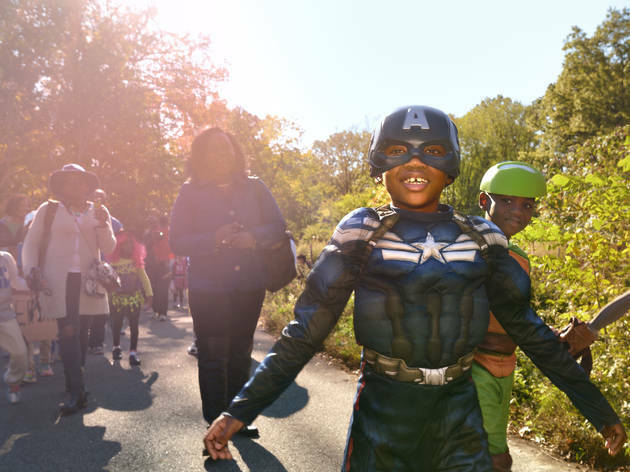 Head to the park's website for more details about the Halloween happenings hosted by the Prospect Park Alliance All ages.